Offering you a complete choice of products which include rcc shop. 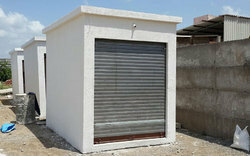 The movable portable shop has been made of cement and concrete in one piece having 4-inch width. The shop is made using the advanced technology for the iron concrete mix made out of modern hydraulic machines. TMT bars of high quality is used to give strength for a long time. Made from M-25 grade concrete. Shutter and window are made from the modern aluminum section. The shop is complete with electric fitting and tiles. The chance of theft becomes less.